provide you the best ride possible. Construction: Firm, high density foam. 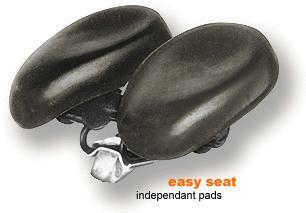 The Horse Shoe Seat is a touring seat designed for maximum comfort with high density foam padding. The center cut-out provides pressure relief to the groin area making it comfortable for men and women. The Bench Seat has been modeled after a farm tractor seat to provide all day comfort. Made with the mature rider in mind and for those that like to take leisurely rides, this contoured seat distributes your weight evenly with no pressure points allowing you to just enjoy your ride. By resting the skeletal system on these seats, the vascular and nervous systems are distanced from possible trauma and helps prevent permanent injury. Other bike seats do not solve health issues; they still allow the delicate tissues to experience constant impact and trauma.